Chapter Excerpt from Pyramids Are Tombs by Joe Phelps: The Origin of Our Mission. The Origin of Our Mission. Our agency started with the Fender Guitar account in 1981. At that time, I thought our mission might be to sell more musical instruments than any other agency. But when we won Baldwin and Gemeinhardt and were, therefore, already serving America's largest guitar and piano and flute manufacturers, it became apparent that we could go for loftier goals. One of our first clients outside the music industry was Childrens Hospital/Los Angeles. When we acquired CHLA as a client, we thought, "We only live once. Our work is only as worthwhile as the clients' products and services we help sell. So, let's work only for clients whose products make the world a better place." We called these clients deserving clients. And the service of these clients is the heart of our mission. Builds the brand while generating appropriate sales impact. Truthfully communicates the attributes of the product. Is delivered on time, on strategy and on budget. Uses the mix of disciplines that best suits the clients' needs. Generates success that is measurable and for which we can be accountable. It may also create strategic partnerships for clients at key stages of program development. In 2002, we agreed to further refine our definition of great work by describing it as work that is a "refreshing jolt to the psyche that gets positive results." We understand that some great work wins awards. More often, it doesn't. However, the personal satisfaction of doing great work and helping a deserving company succeed is the best reward any career can offer. If someone asks what we do, a more conversational way to express our purpose might be to say, "We build brands and sales for products that make the world a better place." Those whose products or services enrich lives and contribute to a better world. Those who enjoy mutually rewarding relationships with our associates. Those who treat team members and business partners in an ethical manner. Those who provide us with honest, timely feedback. Those who value our services as an important part of their success. Those who strive to allow reasonable time for jobs to be produced in a quality manner. Those who allow us to make a reasonable profit on the services we provide. That encourages open, honest and timely communication. That requires that we respect each other professionally and personally. That allows for balance in our work and personal lives. That does not allow for discrimination on the grounds of gender, race, religion, sexual orientation, disability or age and accords equal treatment to each group member with respect to conditions of selection and opportunities for advancement. That provides an aesthetically pleasing, healthful and productive physical workspace that contributes to maximum productivity and bright, positive attitudes. That allows the freedom necessary for group members to maximize their personal contributions and, therefore, reap the rewards of personal satisfaction of a job well done. By enhancing their brand image. By increasing traffic levels, sales and profits. Requires a commitment by both the agency and the individual toward ongoing personal and professional education and development. Requires a constant striving for innovation while providing associates with the best technology available to aid in creating great work. Requires challenging ourselves daily by setting, meeting and/or exceeding our goals and expectations. Requires utilizing timely and effective feedback at all levels, be it among our associates, with clients or among our peers in the industry. 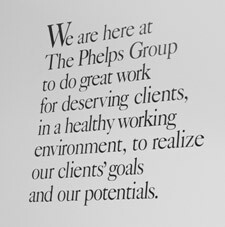 Requires fostering of financial success for The Phelps Group and for each associate, as well as an active commitment to company growth, development and perpetuation.